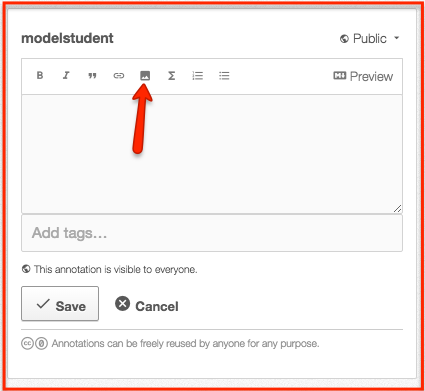 Your teacher will likely have specific guidelines about creating annotations for your class work. Follow these first and foremost — you don’t want to get us in trouble, do you? This means a couple different things. 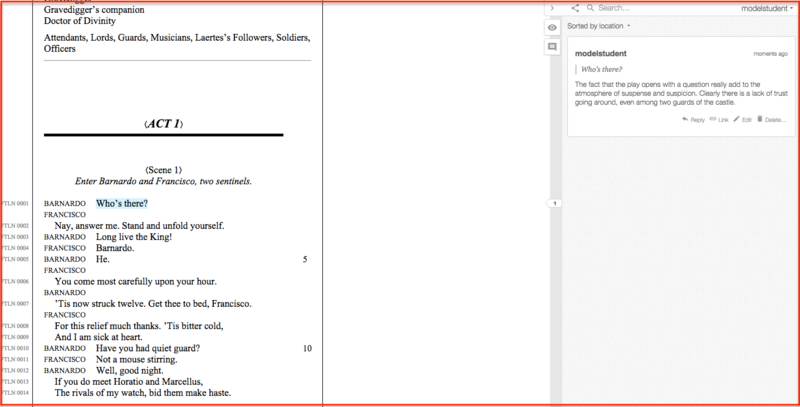 First, you’ll want to focus in on the most intriguing or ambiguous passages of a text for analysis, though as you will see from user modelstudent’s annotations below on the opening of Hamlet, even some of the most mundane lines can be full of deeper meaning. If the passage is difficult to comprehend at first read, then that’s a good sign that an annotation could tell us something interesting. 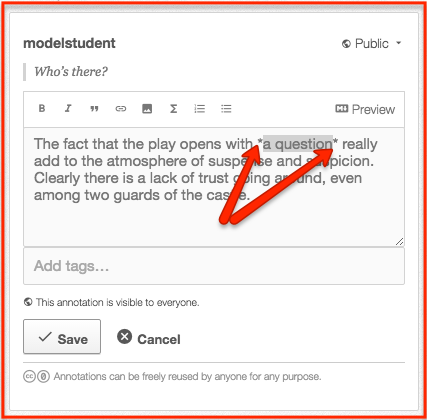 Note: if a classmate has already selected the passage you want to write about, you can either respond by opening their annotation and clicking “reply,” or annotate it yourself by re-selecting the same text. 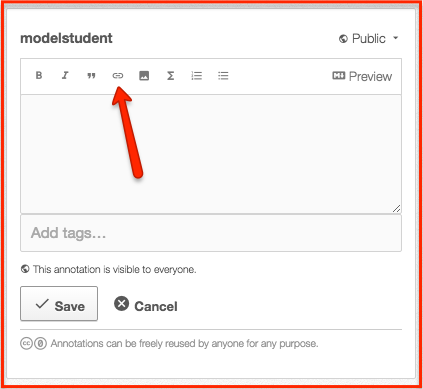 You can also select text within or that includes another highlight or annotation. 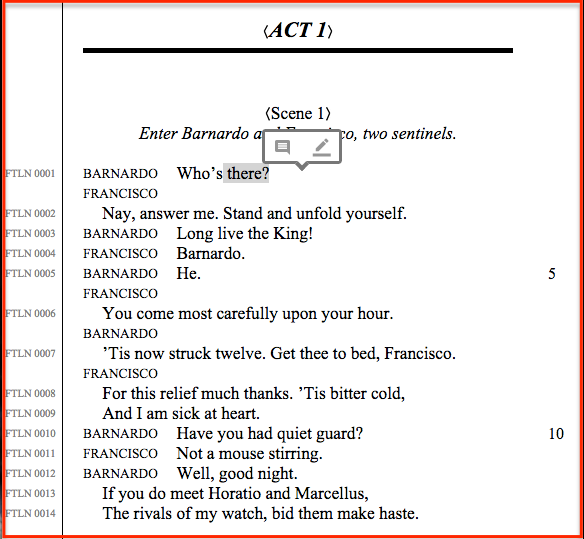 Second, select a discrete, but complete piece of text for your analysis. Even within a passage that is clearly rich with meaning, you’ll want to choose specific words or phrases for analysis. At the very least, think about your annotation as responsible to whatever text you select. Highlight only what you actually want to talk about in your annotation. But also be sure you highlight enough text so that there is something to say about it. In some rare cases, this may be a single word. More likely it is a line or two of poetry or a sentence or phrase from an essay. You probably don’t want to select entire stanzas or paragraphs for annotation; the unit of analysis should be more focused. Second here only in order of appearance, if there was one rule of annotation, it would be this one: Your annotations should add something to what is already in the text you are annotating. In many cases, this means analyze don’t summarize — what your teachers have been telling you in English class since middle school. But a good question can add something to the conversation around the text. So can looking up a difficult word or an unknown reference. Note: again, a big part of making an annotation interesting is selecting the right text to annotate. There are some parts of some texts that are probably not worth annotating or at least are harder to say something “addictive” about. 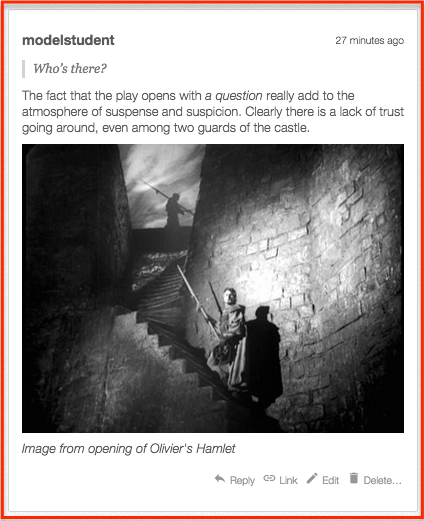 The “Who’s there” opening line of Hamlet above could actually be such an example, but this student did find something additive to offer. This rule doesn’t always apply of course. 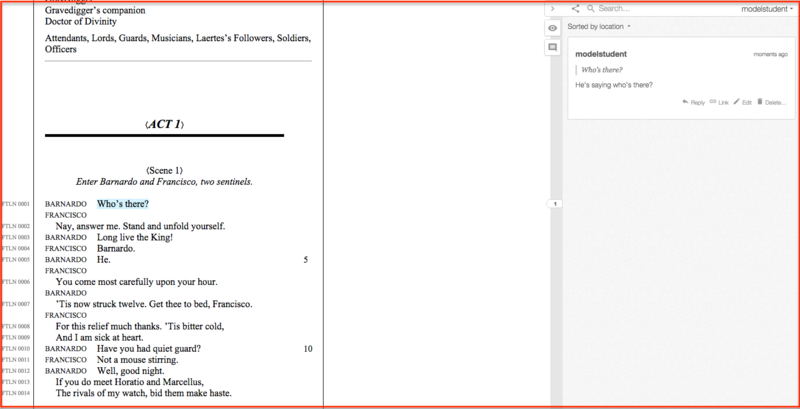 In some cases, for some classes, your teacher may ask you to use annotation as a way to paraphrase or translate passages, and with especially difficult texts, like works of literature from distant moments in history, this is in fact additive. But it’s also true that one should avoid using these formatting elements to the point of distraction. Note: the buttons on the toolbar actually insert what’s called “markdown” (a basic computer language) into the annotation composition window. Below it simply added asterix around a word which I selected and clicked the italics button for. I could have simply added italics around the word. This also means some other formatting available in markdown is possible for which we haven’t yet included buttons. To learn some of the basics of markdown, check out this guide. Links can be used in a lot of ways. They can act like a bibliographical note to show where you got your ideas from — they show you did your homework! 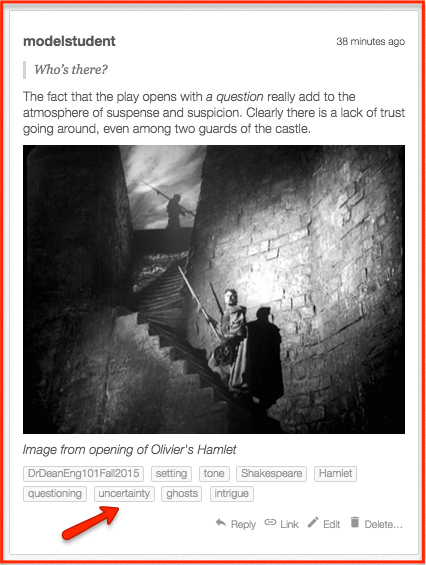 They can make intertextual connections, linking back to other texts read in the course — even other specific annotations on those texts! They can guide your readers toward other relevant readings that are beyond the scope of your discussion in the annotation. On a basic level, images make our annotations more appealing. Think of how much more likely to “like” or click on an status update with image in Facebook versus one that is just text. Aside from appeal, though, images can used to bring a text to life or help make an argument. Your teacher may want to consider things like the copyright status of images you use and giving attribution to their creators, and indeed this is good web practice. Note: we’re working on video embedding so that Youtube and other videos will be playable within annotations as they are, for example, on Facebook. Your teacher may require you to use tags for a variety of reasons. A course hashtag can be particularly useful as it generates a stream of content related to the tag on the Hypothesis site. 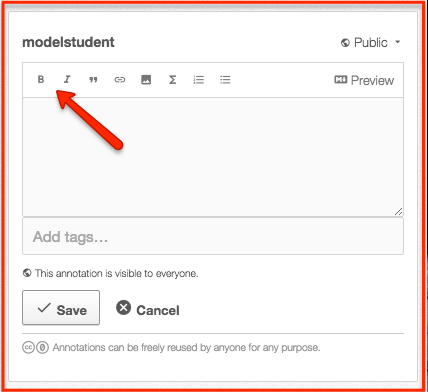 This will allow you and your classmates to follow each other’s work more easily. A teacher may require you to identify certain textual elements like “setting” in annotations as well. Tagging can also be helpful for your own research purposes. In the above example, the student has tagged some thematic elements that may come up later in the text under study or other texts that are part of the course. Having marked these themes might make it easier to gather evidence and quotes for analysis in a final paper.